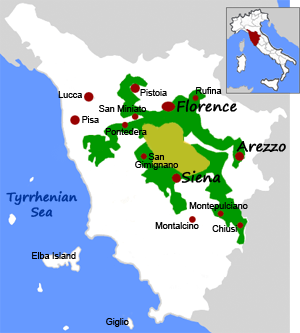 Born in the province of Arezzo which is a breeding ground for excellent young Chianti. Ruby-red in colour, it has a very elegant and full bodied taste with a final note of fruit preserve. Excellent with grilled meats, roasts, typical Tuscan dishes and seasoned cheese. In addition to splendid landscapes, Chianti’s popularity is also directly tied to its fine red wines produced in the region and known generally as Chianti wine. The Chianti region, extending roughly over the two main city provinces of Florence and Siena, is characterized by a combination of almost perfect weather and soil that produces a precious wine considered one of the best wines around the world. The tradition of cultivating vines in Chianti goes back a long time in history, back to the Etruscans that inhabited the area before the Roman empire. Thanks to written evidence dating back to these times it is now known that the Etruscans not only cultivated vines and conducted experiments on grafting and creating hybrids but also produced wines that were widely appreciated.